The Chicago Bears traveled to London, UK to face the Tampa Bay Buccaneers in their first non-North American game in their history. The 2011 Chicago Bears looked to be a sure bet to secure the top wildcard spot in the playoffs. The day was November 20th, the time early evening. The Bears had just won their fifth straight game as they handily beat the reeling San Diego Chargers. The previous week, the Bears had avenged an earlier loss to the Detroit Lions, delivering a 37-13 mauling and seemingly knocking the Lions out of any possibility of the playoffs. The Bears were an improbable 7-3 team at the time. They had started the season 1-2, then 2-3, in the same fashion as they had in 2010. Offensive coordinator Mike Martz was virtually ignoring the run game at the beginning of the season, and the results were indicative of such. But following another return to the run behind Matt Forte, then leading the NFL in yards from scrimmage, the Bears were on fire. Forte wasn't the only reason. Quarterback Jay Cutler looked to finally be hitting his groove as leader of the Bears offense. After the Chargers game, Cutler was on pace to finish the season with 3,700 passing yards and 20 touchdowns. In Bears annals, that would be a remarkable season. As postgame interviews were being completed that November 20th, news began to spread that this Bears season would in all likelihood take a fortuitous turn for the worse. On a seemingly innocuous play in the second half, receiver Johnny Knox slipped on a simple slant route, and Cutler's pass was intercepted. The quarterback instinctively chased after the defender, helping to save a touchdown. On the tackle, replays showed that the quarterback threw his right arm high and towards the defender in the tackle effort, and Cutler's right hand ended up striking the field with force. The end result of this seemingly routine play was a break at the base of the thumb on Cutler's throwing hand. The initial news was that the quarterback would miss a few weeks but would potentially return for the playoffs. 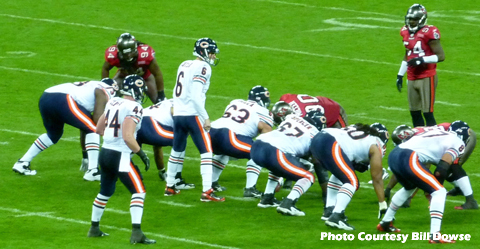 The end news was that the 2011 Chicago Bears would lose five of their final six games, finish with an 8-8 record on the season, and endure one of the most surprising reversals of a season's fortunes in their history. The offseason preceding the 2011 campaign was one of the more unique in NFL history. The Chicago Bears completed the 2010 season with a home loss to the hated Green Bay Packers in the NFC Championship game, then settled down to observe a war of words between the league's owners and players association. In March of 2011, labor negotiations broke down and led to the NFL owners locking out the players, a situation that would remain in place until late July. The 2011 schedule was released during the lockout, and a game involving the Bears would be the only one to ultimately be cancelled-Chicago would miss the opportunity to play the Rams in the Hall of Fame game on the weekend former Bear Richard Dent was enshrined as one of the greatest. The NFL draft was also held in the midst of the labor strife. The Bears held the 29th pick overall, and were in need of improvement at many positions, most notably offensive line, defensive line, defensive secondary and wide receiver. This draft was considered to have a deep crop of first-round offensive tackles, and this was a need position for Chicago. In 2010 the Bears had moved their 2008 first-rounder Chris Williams (thought to be a left tackle prospect for a decade) to guard. Four tackles had been selected when the Bears' pick became close. As Baltimore was on the clock for their 26th selection, Chicago GM Jerry Angelo engineered a trade for the Bears to move up three slots, giving up their fourth-rounder. But time expired on the Ravens' pick before the deal could be consummated and Kansas City jumped in front to select Pittsburgh wide receiver Jonathan Baldwin. Once the Bears knew the player they coveted was still available, they refused to still give their fourth-rounder to Baltimore, a situation that raised the ire of Ravens officials as well as the rest of the league. The gaffe reportedly fell on Angelo and his staff, the last in a line of several inexplicable blunders by the Bears GM over the years. With their own 29th pick the Bears chose massive offensive tackle Gabe Carimi from Wisconsin. They traded up in the second round (using their fourth-round pick per the previous plan) to land the player they would have taken if the first choice was gone: Oregon State defensive tackle Stephen Paea. Their third-round pick was used on California safety Chris Conte, and in the fifth they took quarterback Nathan Enderle from Idaho, a player with whom Martz was enamored. Following the draft the league settled down for almost three months of labor battles. The battle was ended just after training camps were to open, as owners and players realized how close they were to losing revenue. The free agency period was late, brief and chaotic. After the 2010 Bears had made the biggest splash by signing defensive end Julius Peppers, in 2011 they were bargain hunters. Additions to the rosters included Dallas reclamation projects Roy Williams (WR) and Marion Barber III (RB), flamout DT Amobi Okoye from Houston, and bust defensive end Vernon Gholston from the Jets. Also signed was Sam Hurd, another Dallas wide receiver. Losses to the roster included the dean of the Bears, center Olin Kreutz. The Bears had hoped to re-sign Kreutz to a one-year deal, which would have put him in a Bears uniform for his 14th season. But on the eve of training camp, Angelo gave Kreutz a four-hour ultimatum to sign the Bears' only contract offer. Kreutz was frustrated and ended up departing just prior to records he would have set for service with this historic team. As the 2011 regular season approached, legendary linebacker Brian Urlacher made a telling comment on a training camp radio show. When asked to assess the Bears chances to return so strong, so close to the Super Bowl as they were in 2010, the twelve-year veteran said "You always feel like you're going to be right back there, as good as the previous year. But it usually doesn't turn out that way." Taking a break from the third-person narrative here, I have to say that I felt the Bears were probably a team that would finish 7-9 to 8-8 on the season. I felt the Bears were just too lucky, too healthy in 2010 to have a repeat of that fortune. Thus at the beginning of the season, I was skeptical as the Bears hosted the Atlanta Falcons on opening day. The Falcons finished the 2010 season as the NFC's top seed until they were stunningly upset by the Packers at home in the playoffs. On opening day, the Bears were dominant. They sacked Falcons quarterback Matt Ryan five times. Cutler threw for 312 yards and two touchdowns. Forte had 158 combined yards and a touchdown, and the Bears shocked the Falcons 30-12 on a beautiful late-summer day in Chicago. Maybe I was all wrong. Maybe this Bears team was motivated to prove the critics like me wrong. Maybe their players, many of them aging veterans, were going to keep the Super Bowl window propped open by sheer will for one more year. One of my favorite websites www.profootballtalk.com, who had been bashing the Bears' chances all summer, that week reversed feelings and wrote that they felt the Bears were for real and were going to surprise the NFL. As I traveled to New Orleans for a week two matchup to celebrate a milestone birthday, I was a believer. Then in New Orleans no thanks to Martz, the Bears laid an egg. They started strong, scoring an early touchdown. They trailed at the half, but then pulled as close as 16-13. But then after a flurry of sacks and fumbles, the Bears ultimately were embarrassed by the Saints in the Superdome by a score of 30-13. A complete reversal of fortune from opening day. In the game the Bears only attempted 12 rushes, against 45 passes. The old pass-happy Martz was back, and in the ensuing loss at home to the Packers Martz again dialed up 37 passes and only 11 runs in a 27-17 loss. The Bears recovered to beat a rebuilding Carolina team at home, but the next week committed an NFL-record nine false start penalties in the first half of a 24-13 loss at Detroit. The Bears were reeling at 2-3. But then, just as had happened in 2010, something happened to make Martz change his ways. Chicago first won a game against the weak Minnesota Vikings at home, but then faced a challenge against the resurgent Eagles on the road in Philadelphia. In perhaps the biggest Monday Night Football upset of the season, Chicago dominated Michael Vick's team in a 30-24 win that wasn't as close as it seemed. Two more dominant wins brought them to the watershed moment of the season, just after the resounding victory over San Diego. I was watching the Sunday Night Football pregame show, basking in the victory that brought the Bears to 7-3. Everything was clicking. Sure, the Packers were undefeated, but I was beginning to feel that the Bears might actually give Green Bay a run for their money in the playoffs, even at Lambeau Field. Then on that pregame show, it was first announced nationally that Cutler had broken his thumb and would in all likelihood miss the remainder of the 2011 season. Throughout the following week, the Bears organization circled their wagons and rallied around backup quarterback Caleb Hanie. Hanie had rallied the Bears as the third-stringer almost pulled off a win over the Packers in the 2010 championship game, so the thought was the Bears might win three of their last six, make the playoffs, and Cutler would return. It was not to be. Hanie looked respectable in a 25-20 loss at Oakland, but regressed significantly in the next three losses. Forte was also lost for the season in Hanie's second start, which didn't help matters. Hanie finished his stint as the Bears' starting quarterback with worse statistics than all-time horrible Bears quarterbacks such as Jonathan Quinn. By the time the Bears faced Green Bay with their playoff hopes on fumes, Hanie had been replaced by journeyman Josh McCown, who clearly outplayed Hanie. With their fifth straight loss dropping them to 7-8 at Green Bay, the Bears were officially eliminated from playoff contention. With a meaningless win in the finale at Minnesota, the Bears finished the 2011 season with an 8-8 record. (The win also dropped their draft selection from 13th to 19th; it will be interesting to see what future Pro Bowl player might be selected with one of those five picks prior to the Bears). Many smart people argued that the last meaningless game would have been a good time to develop the rookie quarterback Enderle, but Bears Head Coach Lovie Smith argued that it was important for the Bears to win the first game of 2012. The Bears looked like an absolute lock to make the playoffs when Cutler broke his thumb. The broken thumb certainly directly led to major changes in the Bears' organization. On the second day following the end of the 2011 season, the Bears shockingly announced that they were firing GM Angelo, who had two years left on his contract. Heady stuff for a stodgy Bears organization. The divisive Martz also announced that it was time for him to move on. Only history will prove whether Cutler's broken thumb will lead to positive change in 2012 and beyond. Quote of the Year: "You always feel that you're going to be right back there, be as good as the previous year. But it seems like you never are." -Brian Urlacher during training camp, when asked to assess the Bears' chances to go as far in 2011 as they did in 2010. 2011 Coaches: Lovie Smith, Head Coach; Mike Martz, Offensive Coordinator; Rod Marinelli, Defensive Coordinator. Passing: Jay Cutler: Cutler was on pace to finish with 3,700 yards passing and 20 touchdowns before his thumb injury. Final stats were 2,319 passing yards, 13 TD's and an average 85.7 rating. Rushing: Matt Forte: Forte was on pace to have one of the best seasons for rushing and total yards in Bears history. He sprained his MCL against Kansas City and finished with 997 yards rushing. Surprisingly he had just three touchdowns. Receiving: Matt Forte: Typical for a Chicago Bears team with a dearth of quality wide receivers, Forte also led the team in receptions with 52, blowing away the next receivers' tallies of 37. This happened in only 11 games. Unbelievable. Scoring: Robbie Gould: Gould dwarfed any other Bears player by scoring 121 points. The next closest player (Marion Barber III) scored 36. Sacks- Julius Peppers: Peppers finished the season with 11 sacks, three more than in 2010. But he did not make the Pro Bowl. Interceptions: DJ Moore- Moore led the team with a paltry four interceptions from his nickel-back position. 2011 Chicago Bears starters. Left to Right: Offense Jay Cutler, Matt Forte, Johnny Knox, Devin Hester, Roy Williams, J'Marcus Webb, Chris Williams, Roberto Garza, Chris Spencer, Lance Louis, Kellen Davis, Robbie Gould. Defense Israel Idonije, Henry Melton, Matt Toeaina, Julius Peppers, Lance Briggs, Brian Urlacher, Nick Roach, Charles Tillman, Chris Conte, Major Wright, Tim Jennings, Adam Podlesh. While the 2010 Chicago Bears season was filled with good fortune, the 2011 edition of the team seemed to be paid back in kind by fate. Desparate for an upgrade on the offensive line, the Bears not only lost 13-year veteran Olin Kreutz due to a preseason contract dispute, but then lost rookie first-round pick Gabe Carimi to a knee dislocation in the season's second week. The team continued to report that the injury was week-to-week, but Carimi was placed on injured reserve late in the season. One thing fate had nothing to do with was offensive coordinator Mike Martz' decision to pursue a pass-happy offense in the first three weeks of the season, just as he did in 2010. The Bears were 1-2 before Martz dialed back the seven-step drops, resulting in a 5-1 record the next three weeks of the season. Jay Cutler's broken thumb, Matt Forte's sprained MCL, a season-ending wrist injury to guard Chris Williams and myriad injuries to Major Wright and Devin Hester were certainly bad breaks. But stupid decisions also helped lead the Bears to five straight losses. In Caleb Hanie's first start at Oakland, the Bears were driving to take a lead before halftime, when Martz called a screen to be thrown back against the offense. The throw was intercepted and resulted in a ten-point swing in Oakland's favor. In the following two losses, reserve running back Marion Barber III deserves much of the blame. In the 10-3 loss to Kansas City, Barber lined up incorrectly, nullifying a touchdown. Barber followed that up by running out of bounds at Denver. Had Barber not stopped the clock as the Bears were poised to finish out the game, in all probability the Bears would have won. Barber then fumbled in overtime, killing a probable game-winning field goal attempt. Time will tell if the Bears firing their General Manager with no replacement identified will go down as yet another gaffe. The 2011 NFL season began with a lockout by the owners on the first day of the new league year. The lockout would stay in place until late July when the players union and NFL reached an agreement. The Bears scheduled Hall of Fame Game appearance was cancelled. Chicago quickly signed a few castoffs from other teams in free agency, including WR Roy Williams and Marion Barber III from Dallas, DT Amobi Okoye from Houston, and 2008 NFL Draft bust DE Vernon Gholston from the Jets. All but Gholston stuck with the Bears for the year. The Bears had hoped to re-sign 13-year veteran center Olin Kreutz to a contract extension. But as camp began and Kreutz hadn't signed, GM Jerry Angelo gave Kreutz only a few hours to decide on the Bears' final offer. Kreutz was disappointed by the treatment of a Bears legend and left to sign with the New Orleans Saints. He would also retire abruptly during the season. During the preseason, Chicago traded high-performing tight end Greg Olsen to Carolina for a third-round pick in the 2012 draft. Offensive coordinator Mike Martz' system did not value pass-catching tight ends, so the team let go of their most successful player at the position in decades. The Bears had high hopes for first round pick Gabe Carimi, but the rookie was injured and lost for the season in week two. Their hopes were just as high for second round pick Stephen Paea. Paea spent the first four weeks of the season unable to come off the inactive list. In his first action against the Vikings, he had a strong game, even contributing to a safety. He remained a part of the rotation for the rest of the season. The Bears thought they had a gem when they quickly signed castoff Patriots safety Brandon Meriweather, a former Pro Bowler, to a one-year contract. But Meriweather was a bust, playing his way into a reserve role by the end of the season. Speaking of safeties, a large part of the Bears' defensive resurgence in 2010 was due to the play of Chris Harris, who had been re-acquired from Carolina in a trade prior to that season. But Harris was hurt for much of the first four weeks of the season. When he returned he gave up a critical touchdown at Detroit, and was later released. GM Jerry Angelo was embattled for much of what turned out to be his final season with the team. First was his staff's gaffe by botching a draft-day trade with the Ravens that earned he and the Bears no friends throughout the league. Then in December, one of his 2011 acquisitions was arrested on serious drug charges. Angelo bitterly claimed that the signing of Sam Hurd only took place after a careful background evaluation, but facts showed that he was being implicated in drug dealing just hours before he signed a $5 million contract in Chicago. Hurd was released from the team after his arrest. When head coach Lovie Smith was hired in 2004, he pledged that his first goal was to beat the Green Bay Packers. It was something the Bears did only two of the last 20 times prior to Smith's hiring. And the implication was that it was important to do it every year. Smith started strong in this regard, taking it to the Packers six of the first eight times his teams faced them. But from 2008 to 2011, Smith was 2-7 against the Bears' bitter rival, including the 2010 NFC Championship game. Smith's 2011 Bears also earned the dubious destinction of becoming only the second NFL team to lose four times in one year to another team. Following the conclusion of the 2011 campaign, a reporter asked Smith to comment on the fact that his team had missed the playoffs four of the last five season. Smith's Lovie-logical response was that to him, his team had made the playoffs in one of the last two seasons. 2011 was the season for passing offenses in the NFL, while the Bears continue to gravitate back to the run. Three quarterbacks (Drew Brees, Aaron Rodgers, Tom Brady) finished with over 5,000 passing yards. Brees broke the NFL record for passing yards in a season, but still didn't win the MVP award given to Rodgers. The Packer quarterback's season was one for the ages, on a team that has been blessed with fortuitous quarterback acquisions over the decades. Traded tight end Greg Olsen to Carolina for 3rd round pick in 2012 draft.